1 What’s the OrangeRX modules pinout ? 2 How to improve the range? 3 How to increase the power ? 4 How to activate the brown-out detector ? 6 How to access the serial port ? What’s the OrangeRX modules pinout ? How to improve the range? Just do it, the provided cables have very often issues (open or short circuit), sometimes immediately and sometimes after several manipulations. Always replace them by another one, such as this one. One side is a “U.FL” connector, the other side is a SMA connector. 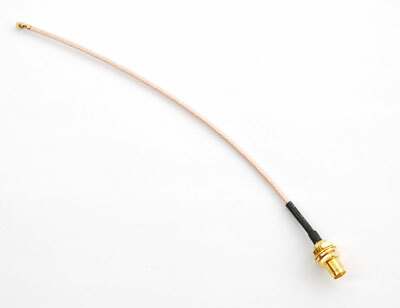 Not mandatory, but can avoid unwanted disconnection of the UFL connector. The stock antennas of OrangeRX modules seem to be 2.4GHz antennas, and will provide a very low range of a few hundred meters. Avoid interference sources. Two users who were using bluetooth modules inside or next to the OrangeRX modules have reported lost packets at short range. How to increase the power ? The out-of-the-box power of the “1W” OrangeRX is around 400mW. However their RF module can really achieve 1000mW, with a simple modification described on this page. How to activate the brown-out detector ? 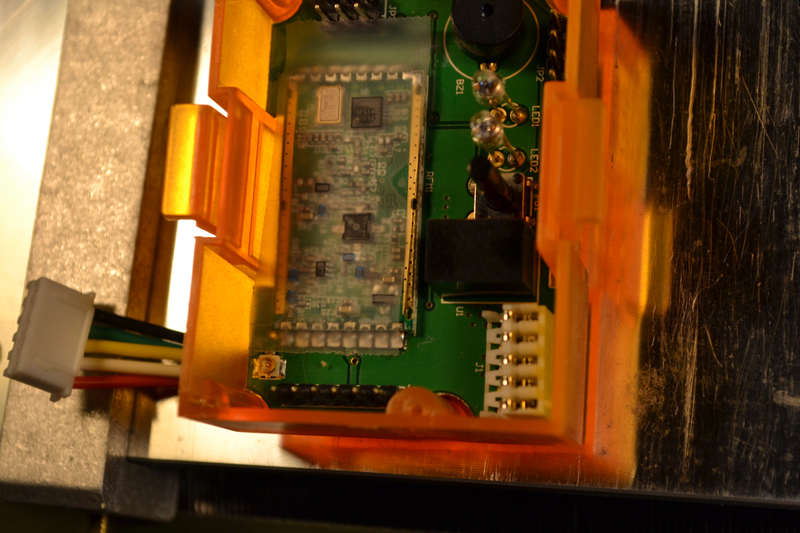 Please see this page for information about the brown-out detector on the OrangeRX modules. 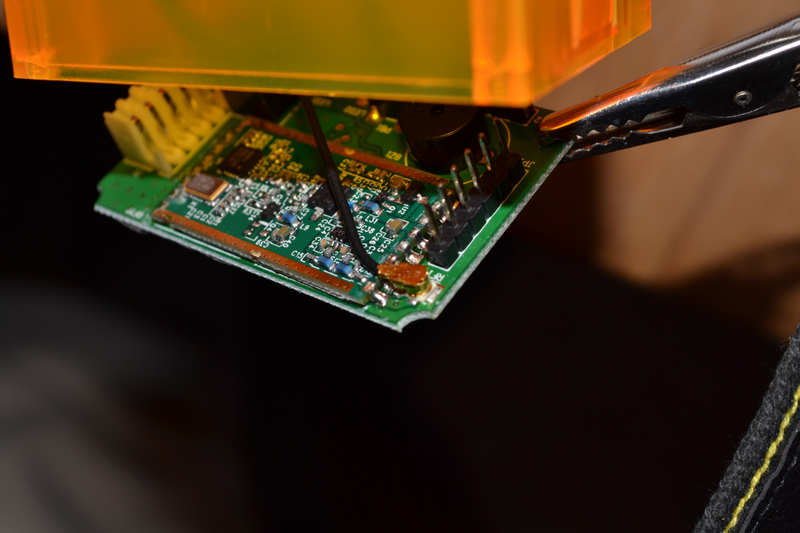 A the connector can rotate, it will easily come in contact with the pins, in particular the first one and that’s problematic : The external part of the RF connector is GND, and when it touches the first pin of the module it shortcuts the antenna. It can damage the module, but usually it will survive a short contact. Maybe this can cause a sudden voltage drop and reset of the atmega too. The photos are from two different brand new modules, first opening. Notice that touching the second pin is not an issue, but touching the first (in the corner of the RFM module) is short circuiting the antenna output. On these two modules it seems that the RF connector is on the second pin, but it’s freely rotating and can touch the first one too. How to access the serial port ? The pins RX_ON and TX_ON on the RFM23BP (1W module) are named differently : RX_ANT and TX_ANT on the RFM22B (100mW module), and are reversed. Hi! maybe someone knows what is “RF” pin at OrangeRX TX 1W module PPM-connector? It goes to R2. There is any different between Futaba and JR modules except pin-outs? Because HK doesn’t restock the Futaba compatible module and I thought I can purchase the JR instead. I’ve own a Futaba 7C 2.4Ghz transmitter and I’ve to hook it up directly to the board anyway. Will the JR module will work? 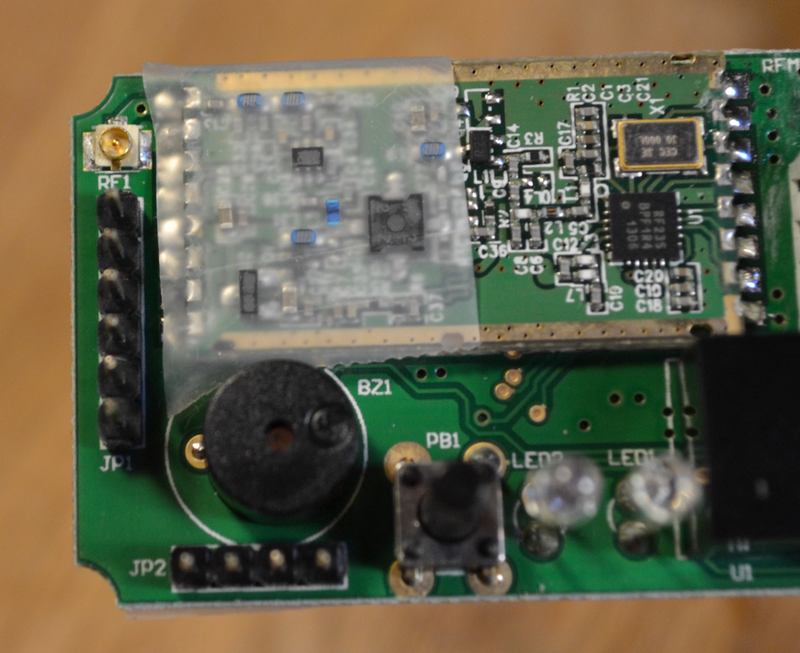 The difference is only in the pinout, you can use a JR module and connect it with 3 wires to a Futaba transmitter. 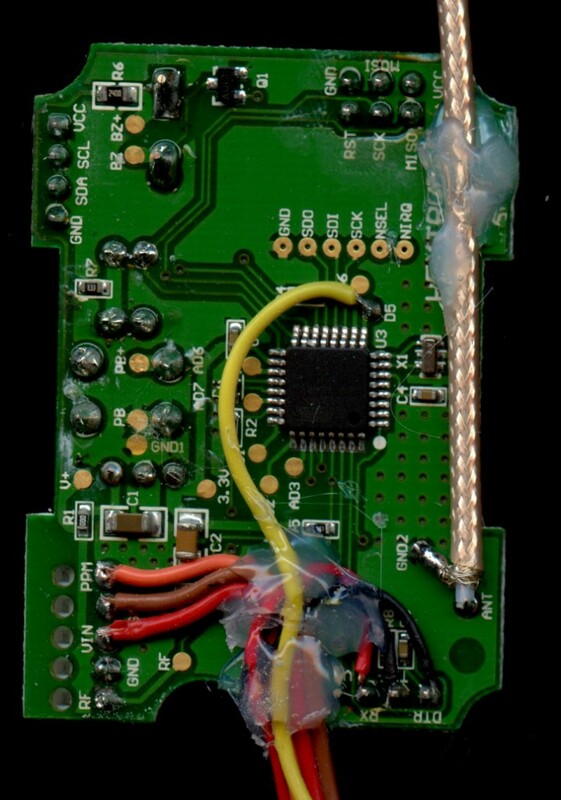 Can someone explain what the receiver module is in this HobbyKing listing. Is this the receiver that goes in the plane. If so where are the servo plug sockets or serial port? This system output serial PPM, so all channels on one pin. Then this pin is to be connected to a flight controller such as Pixhawk, and this one has outputs for every servo. HobbyKing currently advertises some 1W OrangeRX Receivers, but the description is somewhat misleading, stating RFM22 module. Are those really 1W modules? That form factor would be more convenient to use on the model than the bulkier TX module. It’s 1W module but the real power is more around 500mW because it’s not powered at maximum voltage. 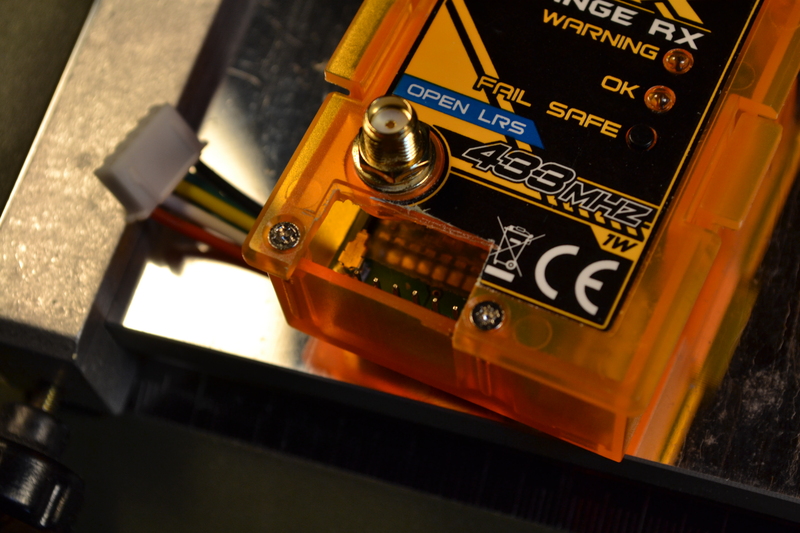 Notice that the new OrangeRX modules aren’t supported yet. Hi, I’ve received a set of the new OrangeRX 1W TX/RX modules with Bluetooth. Is there any way I can contribute to enable support of these new modules? I am an embedded software engineer with some electronics experience. Hi, thanks for your help but for the moment this software is closed source. I’m planning to support these modules but can’t give a precise timeline. But if you check in the ULRS thread https://www.rcgroups.com/forums/showthread.php?2037442-Ultimate-LRS-40-km-APM-Telemetry-RC-link-for-54-%28using-2-OrangeRX-1W-TX%29 someone was able to use ULRS with these modules with minor modifications. Yes usually replacing the RFM module is sufficient, in some cases the atmega328p must be replaced too. Are these two models identical? If i set up the ports, can i use futaba version on the Taranis Controller? Absolutely, it will work fine. Are there any measures against hijacking of the RF link? Is there any kind of binding? Or will every ULRS module talk to every other ULRS module? Are there any measures against damaged packets on the RF link? Is there any kind of checksum? Are damaged packets discarded? The 2.25 beta version will include AES-128 authentication and encryption. The current beta version 2.24 uses a simple binding, so it won’t accept messages from any other module around. In addition the protocol used and the packets structure are not public. The system is using frequency hopping, and the time spent on every channel is variable and impossible to guess for an external observer. All traffic is CRC validated (at the packet level and at the message level) and any damaged packet is discarded. So it’s secure, nothing similar to the drones that can be hacked with a wireless wifi stick. But the version designed for complete security will be the beta 2.25. Hi – is the encryption idea still possible, or are you leaving it for a later release? We’re at the limits of the current hardware, but the Ultimate LRS Teensy will maybe include encryption. Hello, I’am running OpenTX with mavlink ext. and trying to get data displayed with ULRS – OrangeRX Tx 100mW and Rx 100mW. Found several HW mods but not sure which one will work, could do a try-out but maybe someone already has found a good HW modding solution? Hello, notice that a 100mW TX – 100 mW RX is not supported, because it offers a limited range. I recommend to use 1W TX and 1W RX, even if 1W TX with 100mW RX is supported in the 1.06 version. Notice that the 1W from Hobbyking only provides around 400mW. You can find a mod to upgrade it to 1W in the FAQ page on this site. Hi! I plan using the UltimateLRS on quadcopter for not too large distance. I think, for me enough the limited range. There is some obstackle using the 100 mW TX module? If I know right, the RFM22B and RFM23BP are similar, only the RFM23BP have an discrete amplifier on output. I’m finalizing the 100mW support in the firmware in a few days. 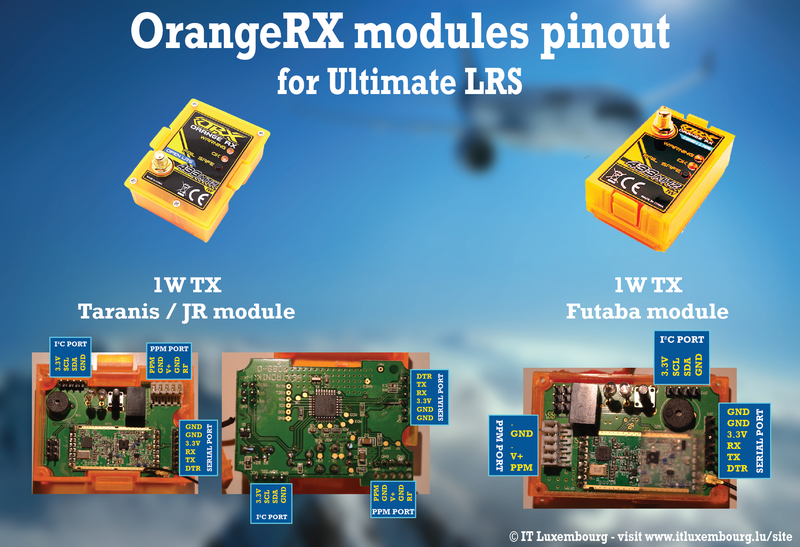 The RFM23 and RFM22 modules have the same pinout, but their connections to the OrangeRX 100mW and 1W modules are different, that’s why the firmware has to be adapted. I’m trying to have a bidirectional link between two orange rx (433MHZ, 100MW). However, when I am sending data through the serial port I can not see the data on the other serial port of the second orange rx. Ultimate LRS doesn’t support two 100mW modules, are you using another firmware ? With Ultimate LRS you’ll see whatever you type on one side, on the other side of the link. I’ve to tell you that I used two 100mW and it was working well, until something happened and I’m not sure what and why you ask to use one of them 1W ? Normally the firmware only supports 1W TX, and 100mW or 1W RX. I don’t see how it can have worked with 2 x 100mW, because the pinout is different ? Are you sure it was with ULRS firmware ? It is a fully user-customizable RF transmitter system. Open LRS TX Module a very versatile unit perfect for your custom projects. Might get away with not using a switching regulator. 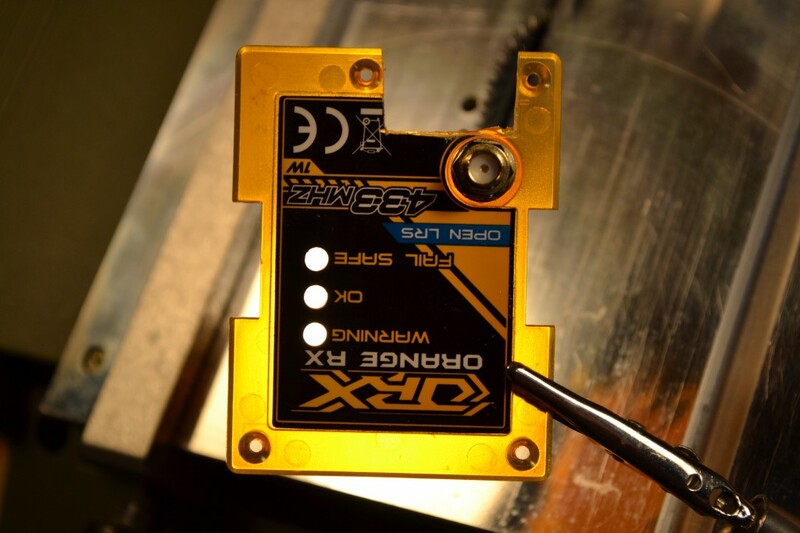 What you can do is to power the RFM23BP module directly from the ESC (5 to 6V), and let the rest of the circuit be powered by the OrangeRX 3.3V regulator. If you want to avoid a switching regulator, be careful that linear regulators such as 7833 need a certain voltage drop which can be superior to 5V-3.3V = 1.7V. There are other similar linear regulator with low voltage drop. 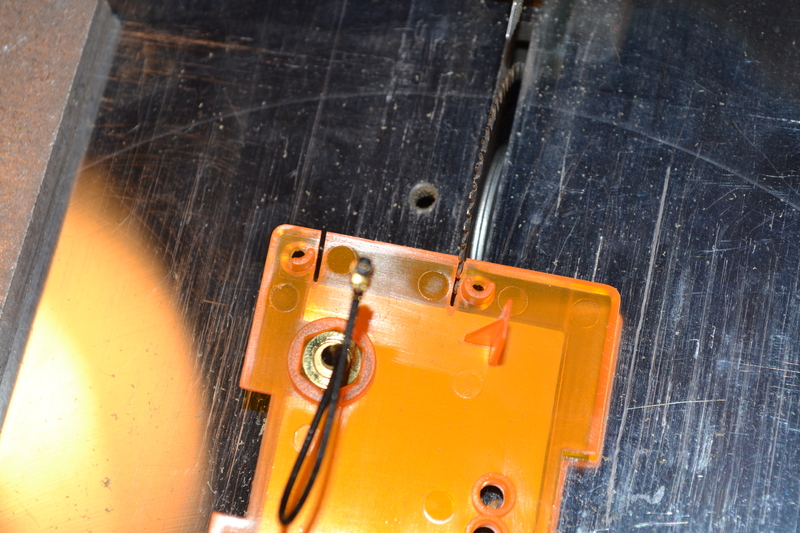 LD33C did the trick, bit arkward though as the pin out is in a different order. Are you sure the RFM23BP is only 3.3v tolerant on the IO’s datasheet says 3.3-6v and I can’t see anywhere them specifying 3.3v on the IO’s , just says VDD +/- 0.3v, page 10, reason I asked is the regulator on one of my modules seems to be fried, only producing 1v on the output, has anyone tested it at 5v for prolonged use? I have currently just bridged the regulator, so I will let you know when/if it dies. Hi Joseph, that’s a point that I checked directly with the manufacturer, after having fried several modules. Some of them stopped working at all, some others had some specific pins which stopped working, another module lost a lot of RF power. And some others had no other issues than overheating and consuming too much current. It seems that I fried one too, since it stop working. How can I know for sure and How can I fix it ? 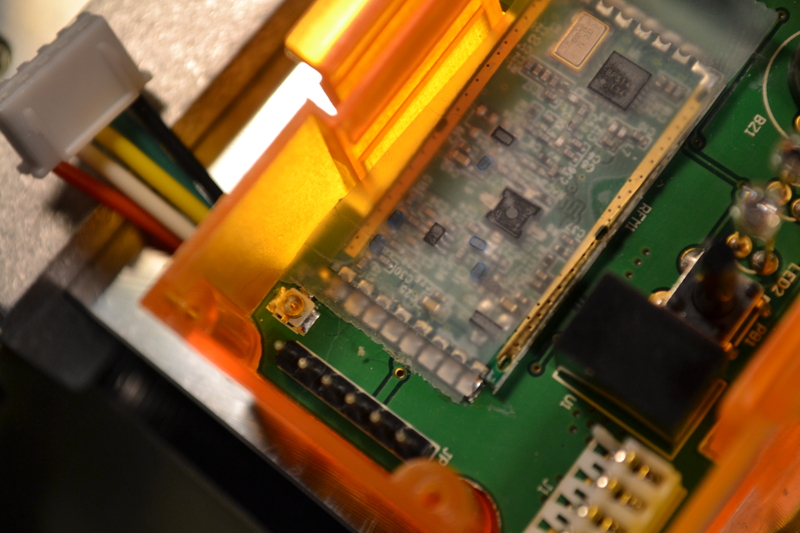 Replacing the RFM module could work, or the RFM + atmega, but that’s almost the cost of a new OrangeRX module. So that means the datasheet is lying.. Yes the datasheet is misleading. I checked directly with the chip manufacturer who confirmed the 3.3V level on digital pins (see OrangeRX FAQ page). That’s a good question, the ATMEGA can handle that voltage, and it would actually be better for it as it runs at 16 MHz (running it at 16 MHz under 3.3V is not within its specs). But the RFM22 / RFM23 requires 3.3V (max 3.6V) on its IO pins. This point is not clear even on its datasheet, but I checked it with the chip manufacturer. Also you can see the IO pins traces are directly connected to a 3.3V chip on the RFM module (SI4432 or similar). The 1W module is quite resistant to 5V, because it can accept up to 6V (by its specifications). However it’s still bad practice to power it by the serial port, because it powers the atmega to 5V, and so it sends 5V on the IO pins of RFM23BP modules, which are designed for maximum 3.6V. That creates heat and in the long run can destroy the chip. The 100 mW is almost immediately killed by 5V, which are completely outside its specifications. The stories of destroyed modules that you can see in the forums are almost all related to the 100 mW modules. If I’m powering my ULRS through the atmega off my 5v BEC, is the RFM23BP powered at 5v or stepped down to 3.3v? Do I still need 5v (or 6v) directly to the RFM23BP? I want to achieve 800mw of power before I run some longer distance tests. I’m not sure if I need 1w(yet). Thx! The next release will support DTF UHF, it will also be possible to combine OrangeRX and DTF modules, they both will work as RX or as TX.